UM Global Motorcycles has added another model to its product portfolio for India. The new UM motorcycle is called the UM Renegade Commando Mojave Edition. As the name suggests, the new motorcycle is based on the Renegade Commando. While its specifications and mileage are the same as those of the regular Commando, it gets a new paint option and a set of saddle bags to enhance the practicality and even the style of the cruiser motorcycle. 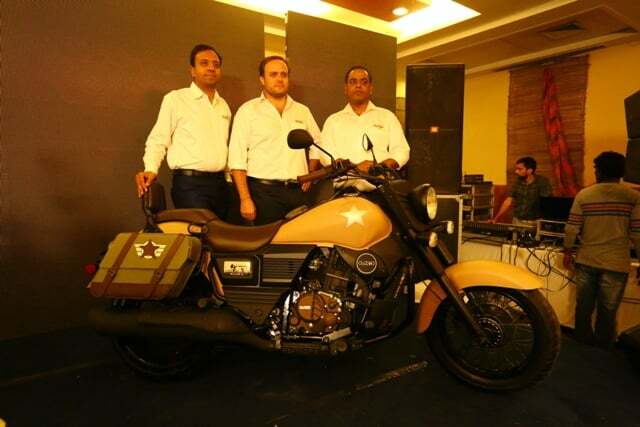 The UM Renegade Commando Mojave Edition price in India has been kept at Rs 1.80 lakh. Like we said, specs and mileage remain unchanged. This is because it comes with the same 279.5cc engine that powers the Renegade Commando. Also See- UM Renegade Classic India Launch Soon! It is noteworthy here that UM Global Motorcycle has been pretty quick to catch the attention of many cruiser bike lovers across India. The UM Renegade Commando, thanks to its true-blue cruiser styling, seems to have generated enough interest among new bike buyers. With the launch of the Renegade Commando Mojave Edition, which looks even cooler, UM Global is likely to enjoy an even stronger foothold in the ever growing Indian bike market. The new UM motorcycle has an ex-showroom price of Rs 1.80 lakh. The regular Renegade Commando costs approx. Rs 1.68 lakh. The Mojave Edition will try to justify the higher price tag by offering added practicality and more style through the set of saddle bags it comes with. Also, the bike’s bespoke paint scheme helps it stand out. Powering the UM Renegade Commando Mojave Edition is the same 279.5cc, single-cylinder engine that powers the regular Renegade Commando. This single-cylinder engine has a Carburetor setup and comes mated to a 6-speed Manual Transmission. This engine offers a maximum power of 24.8 BHP at 8,500 RPM and a peak torque of 23 Nm at 7,000 RPM. Suspension duties are taken care of by a set of telescopic forks up front and twin shock absorbers at the rear. Braking force comes from a 280 mm disc brake up front and a 130 mm drum brake at the rear. As the engine comes from the Renegade Commando, even the mileage remains the same. The Mojave Edition can deliver up to 35 KMPL on the highway and around 30 KMPL under combined usage. While this bike isn’t the most frugal model on sale in the country, it’s still a respectable mileage from a bike that offers roughly 25 BHP of power from a carburetted near-280cc engine. The new UM Renegade Commando Mojave Edition is likely to have a real world top speed of 125 KMPH. Stay tuned for more on the UM Renegade Commando Mojave Edition India.